This is one Massachusetts drug offense that, to put it plainly, you “don’t want to mess around with.” In our view, this is one of the worst drug laws on the books in this state, largely because of the extremely severe mandatory minimum jail sentences involved, which can run up to a maximum of 15 years in state prison. This is largely due to the way that the statute was written, in response to enormous public pressure on the Massachusetts Legislature to “do something serious” about drugs and school-age children. As one sign of just how serious this offense is in Massachusetts, a conviction on a school zone drug violation carries a mandatory minimum prison sentence of two years behind bars. These charges can be a very complicated area of Massachusetts drug crimes, and if you’re charged with this offense, you’re going to need an experienced Massachusetts drug crimes defense lawyer to defend you as soon as possible in order to protect your legal rights and preserve all possible defense strategies. The prosecution doesn’t need to prove that the defendant intentionally meant to distribute illegal drugs within the school zone involved, to get a conviction on this charge. All they need to show is that the defendant did in fact possess a controlled substance(s) within 1000 feet of a school or 100 feet of a park or playground, and that he/she had the intent to distribute the controlled substance(s) somewhere, to anyone. A person could have met a friend in a coffee shop for the purpose of giving him – free – a little over an ounce of marijuana for personal use – and if a school is anywhere within 1000 feet of that meeting place, that’s enough for prosecutors to bring this charge. A person could be in his home or apartment doing the same thing, and still be charged with this crime if the building he/she lives in is within 1000 feet of any school property or charter school, or 100 feet of any park or playground. The District Attorney does not have to prove that someone charged with this crime was either on a school property, or that he/she even knew that he/she was within 1000 feet of a school, or within 100 feet of a playground or park, in order to get a conviction. Think that 1000 feet is not that long, so the risk of triggering this offense shouldn’t be that high? Consider this: 1000 feet is over 3 football fields long. The relevant distance (whether 1000 feet to a school or 100 feet to a park or playground,) is measured as a straight line from the school's (or playground’s or park’s) boundary to the location of the alleged act. The distance isn’t measured by traveling up and down streets, but by a straight line. The result? In the geographic configuration of most cities or towns, measuring 1000 feet from almost any point will run into a school zone. In many increasingly dense urban and suburban communities, it’s almost impossible to not be within 1000 feet of a school zone at any given time. The Court is simply not going to care what the defendant did or didn’t know about a school’s boundaries, or whether the defendant even knew this law existed. The judicial approach is extremely severe. “School” doesn’t mean under this statute what you might typically think of -- an obvious-appearing grammar school, middle school or high school. The legal definition is very broad. A tiny school in a private setting with only a few students is considered a "school" under this statute. Head Start facilities that are accredited. 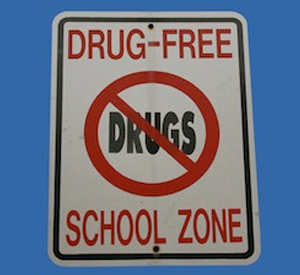 A defendant who has been convicted of a Massachusetts school zone drug violation will be sentenced to state prison for a term of anywhere from a minimum of 2 ½ years to a maximum of 15 years, or alternatively to a County Jail/House of Correction for a minimum term of 2 ½ years. Under all circumstances following a guilty verdict, there is a mandatory minimum prison or jail sentence of 2 years. This is for the school zone drug violation alone, in addition to any sentence for a Possession With Intent To Distribute charge or a Massachusetts Drug Trafficking charge. Above and beyond a prison or jail term, a fine of a minimum $1,000.00 to a maximum $10,000.00 will also be imposed. A note about “mandatory minimum sentencing”: This term means that, following a guilty finding, a judge has no choice but to sentence a defendant to one of the above mandatory minimum periods of incarceration. The judge cannot show any mercy, or exercise any discretion in sentencing. Also, there is a major difference between a County Jail/House of Correction, and a State Prison: County Jails typically house lower-level offenders who are not generally very violent. State prison is altogether different: Trust us, you don’t want to end up there. You can see the severe approach to this offense. The legislative objective of this law is to ensure that school zones are drug-free, and the courts have very little tolerance for defendants convicted on this charge. If you or someone you care about is facing this charge or other Massachusetts drug offenses, the decision you make about who to hire as your attorney will literally determine your future. It would be extremely unwise to choose an attorney that handles these serious drug cases only “occasionally.” It would be just as unwise to “shop” for the lowest legal fee available. You will probably get an inexperienced attorney, who will produce a very substandard result. The proven maxim, “You get what you pay for,” applies to the legal profession just as it does for any other profession. Don’t make a serious mistake that could potentially destroy your future. Our proven results are among the best in the legal profession in Massachusetts. We know how to very aggressively and successfully defend Massachusetts School Zone drug charges and we know how to make sure you are legally protected to the maximum extent possible. We have been very successful in securing either acquittals on these charges, or in reducing the charges to eliminate the exposure to a mandatory minimum prison or jail sentence. Call us 24 hours a day, seven days a week at Ph. : (781) 320-0062, or at Ph. : (617) 285-3600, or contact us online here for a free initial consultation and we’d be glad to let you know what your legal options are, and how we can help you. The sooner we can start protecting you, the better off you are going to be.